To brighten and enrich lives, families and communities through enjoyable shared creative experiences. 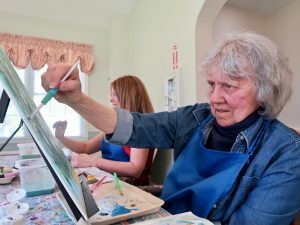 We do this through our collaborative community arts programs that are designed to bring joy to seniors of all ability levels by providing opportunities for meaningful engagement, creative discovery and lifelong learning. We believe that every person is precious, has inherent value and dignity, and should be treated with charity, respect and compassion to live full and enriching lives. We value and all need meaningful, positive interactions with others. 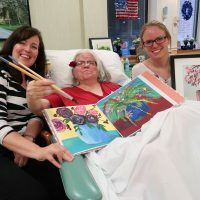 Creativity flourishes in community, which is why so many of our programs are built around shared quality time creating beautiful memories together. While some of our clients with dementia won’t remember what we’ve taught them, they will know the joy of making something beautiful in the moment. And that joy is priceless – to them and to us – as is sharing it with others! People at all stages of life thrive when they feel engaged in something meaningful, and are enjoying learning something new. Making art offers a new learning experience and an opportunity for growth and discovery. As teaching artists, we too seek to learn something new for and from every client, and are passionate in our pursuit of excellent care and service by learning about and implementing best practices in our field. We recognize that many who would benefit from our programs, have very limited financial resources. Which is why we actively search for grants we can apply for, and have our own Benevolent Scholarship Fund to help provide scholarships for seniors in our community. We fund these scholarships by donating a portion of our profits, as well partnering with our client families and members of our community who help us with donations through memorial gifts and sponsorships.